Though short of the discussion dedicated to Donald Trump, it’s been interesting to note the amount of dialogue dedicated to bale net wrap during the past few months. However, it’s safe to say that the performance of the latter, at this point, is a bit more predictable than the former. Spinning sisal or plastic twine on bales necessitates 20 to 30 turns of the bale chamber compared to 1-1/4 to 2-1/2 turns with net wrap. This improves baling efficiency by 30 to 35 percent, according to Kevin Shinners, University of Wisconsin agricultural engineer. That translates to more bales per hour and a reduction in machinery time, labor, and fuel. Because the bale spins fewer times in the chamber, less leaf loss occurs in the field. Shinners’ research from 2002 documented about 1 percent dry matter loss with net wrap compared to nearly 3 percent for twine. In the Wisconsin trials, dry matter losses for outdoor storage were nearly 20 percent for sisal twine, 11 percent for plastic twine, and 7 percent for net wrap. The net-wrapped bales were superior at shedding water and at keeping moisture from infiltrating the outside of the bale. This advantage will be somewhat negated unless bales are stored on a well-drained surface. Further, outside net-wrapped bales will still suffer more dry matter loss than any type of bound bale stored inside. 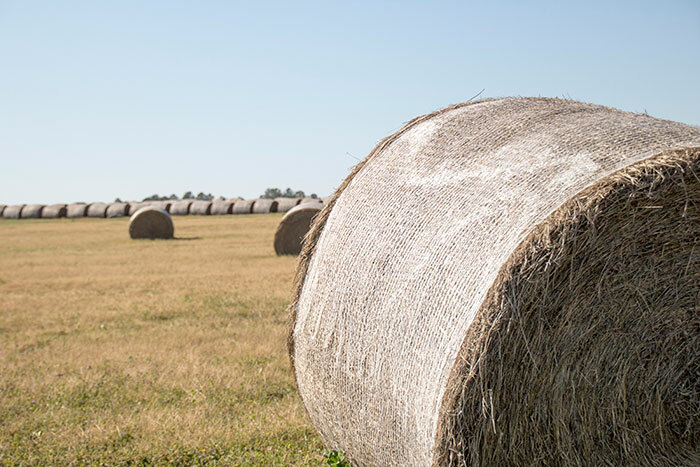 Although more subjective in measure, net-wrapped bales tend to hold their shape, integrity, and color better than twine-bound bales. Unlike sisal twine, net wrap won’t rot or be subject to rodent damage. Coupled with the previously mentioned attributes, this makes them more appealing to a potential buyer. The disadvantages of net wrap are primarily centered on costs. A net wrap-equipped baler is going to be more expensive than a standard twine round baler. Further, the net wrap will cost about 40 to 50 cents more per bale than plastic twine. The additional costs of net wrapping are easily recovered by large volume operators, those who routinely store all or a portion of their production outdoors, and by hay growers who market a considerable amount of their production. These factors include a vast majority of hay producers and is probably why nearly all round balers sold today are equipped to net wrap. What goes on the bale must come off. Or does it? Net wrap does a great job of maintaining bale integrity; it can also be difficult to remove during winter when the bale is exposed to ice and snow. We talked about this in last week’s eHay Weekly. Cattle don’t digest net wrap (and plastic twine). Rather, it accumulates and takes up space in the rumen. There have been several documented deaths from ingestion and likely many more undocumented such occurrences. “Since net wrap does not appear to be digested in the rumen, it can accumulate, says Taylor Grussing, South Dakota State University extension cow/calf field specialist. “This may have implications on production efficiency and animal health if the digestive system is compromised,” she explains in a recent edition of SDSU’s iGrow newsletter. Grussing notes that the risk of loss is going to be related to how much is ingested and how long an animal’s exposure is to net wrap. “Cows fed exclusively long hay in net-wrapped bales from self-feeders would be at greater risk than feedlot cattle on a high-concentrate diet,” Grussing says. “Still, those feedlot cattle could accumulate significant amounts of net wrap,” she adds. This is a problem with a pretty easy answer. Remove the net wrap prior to feeding. Grussing says if it can’t entirely be removed upon feeding, retrieve the remaining net wrap after the bale is gone. For hay that is going to be ground, net wrap will need to be removed prior to the grinding operation. In addition to potential digestive issues in cattle, net wrap that is left on bales and not consumed may easily find its way to mower shafts and manure spreader beaters. Removal is not a pleasant job. Finally, if you need one more reason to remove net wrap from bales before feeding, allowing cattle to feed on plastic is not an easily justified animal welfare practice until research indicates otherwise. Like it or not, this always needs to be taken into consideration. Feel free to offer your opinions and practices regarding net wrap below.